Luxury classic menswear in unexpected fabrics. Finding inspiration through beauty and his surroundings, Jay Kos delivers a traditional style for men with an elegant twist. To some, fashion is defined by the latest trends and how you wear them, but for menswear designer Jay Kos, it is a personal experience that tells a story about who you are. Customers are greeted by is his tongue-in-cheek logo, an amusing "monkey," above the entrance and emblazoned into the sidewalk outside the shop's door. The iconic monkey is seen repeatedly throughout the boutique in photos, figurines, and even stitched onto leather boots; a silent graphic message from the designer reminding us that fashion is to be fun, and not to be taken so seriously. Void of commercial industry pressure to churn-out four collections every year, Jay allows his creative juices to flow whenever they come to him, approaching design through imagination and spontaneity, resulting in fashion that is as equally intriguing as his clients. 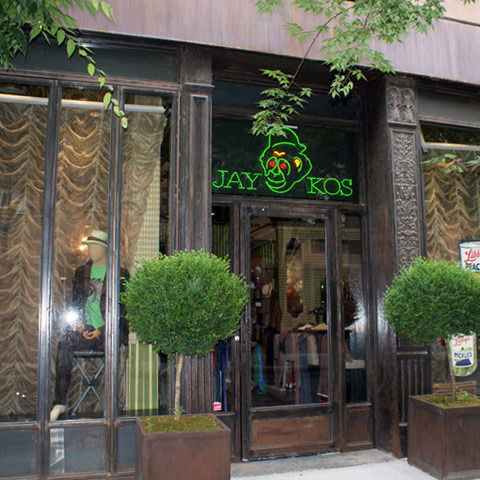 With its handsome interior, furnished with velour upholstered couch and swivel barrel chairs, stepping into Jay Kos is like stepping into a men's luxurious walk-in closet full of vibrant and bold colored classics fashioned out of fabulous exotic fabrics. Here you can find all the fancy tailored and casual wardrobe staples from-head-to-toe, such as custom Italian suits, colorful polos, soft pile silk velvet vests and pastel boat shoes. The lower level is reserved for tailoring; final touches and custom alterations by Jay's in-house tailor. The shop embraces fun style in a kaleidoscope of colorful textures and fabrics manufactured in countries around the globe; transforming simple classics, such as pants and jackets, into seductive luxuries, when crafted from the skins of exotic python, ostrich leg, alligator, and the Brazilian fish, Paracarru. Additionally, you will find the ideal accessory discretely on display beneath the smokey glass table top: diamond jewelry adorned with his signature monkey logo in sterling silver and 22k gold. The brand holds a touch of outrageous with a depth of richness, a wardrobe suited for rock stars like Mick Jagger or Steven Tyler. His affluent clientele ranges from celebrities, athletes and musicians, to hedge fund professionals. Stocked with plush, timeless pieces, customers are sure to find a tasteful selection that embodies their unique personalities. Sure to keep his clients happy and comfortable Jay is known to serve lattes and even a cooked meal for those that catch him on the right day. Clearly, Jay Kos is for the daring man who's not afraid to stand out and be noticed. It reminds us of the fun and playful side of fashion. Whether you’re picking up a silk tie, a herringbone-printed pony skin jacket, or a handsome custom tailored suit, you’re sure to turn heads with a sensational piece.